Michael Gerard Tyson was born in Brooklyn, New York, on the 30th of June 1966. His upbringing came on the streets of Bedford-Stuyvesant and Brownsville, the latter in particular a dangerous landscape littered with abandoned tenements. His single parent mother had children but no husband and little money. Tyson remembers her as a person incapable of much affection. At 12-years-old Tyson is carrying a gun, mixed up with drugs and violence, and running with the wrong crowd although – as he remembers – there was no other life available to people like him. Or so it seemed. Tyson ends up in a special upstate New York school, a detention facility called the Tryon School, where his colour and size, not to mention his stroppy moods, soon provoke tension. However, his life changes forever when he takes up boxing through Bobby Stewart, a Tryon School staff member. Nearby lives Cus D’Amato, now virtually retired and in his seventies. D’Amato is an eccentric and wise boxing trainer who guided Floyd Patterson to the heavyweight championship. His Victorian house, which he shares with longtime companion Camille Ewald, is like a dormitory for troubled youngsters attempting to become boxers or trainers. “That’s the Heavyweight champion of the world,” says D’Amato after watching the teenage Tyson spar for the first time. D’Amato becomes the father Tyson never had and legally adopts the youngster in 1981. It was probably the last time his life was ever vaguely normal. D’Amato is friends with businessmen Jim Jacobs and Bill Cayton – who own the world’s largest collection of boxing films and will soon control Mike Tyson. As Tyson attracts attention as an amateur boxer, he sometimes causes trouble outside the ring with alleged assaults and inappropriate sexual behaviour. Jacobs, aware of the potential of Tyson, keeps him out of court and always minimises the fallout for Tyson. One can see in this part of Tyson’s development seeds of his eventual downfall and dysfunction as an adult. The boxer never faced the consequences of his actions. He never had to learn the difference between right and wrong. The one person who did make a stand was Tyson’s amateur trainer Teddy Atlas, another D’Amato disciple. The furious Atlas pulls a gun on Tyson when he learns Tyson has made lewd sexual comments to an eleven-year-old girl who happens to be Teddy’s niece. For his troubles Atlas is sent away lest he should disrupt the carefully laid plans set down for Tyson. Atlas felt that Tyson was getting away with far too much and had to be confronted. Tyson had missed a spot in the American Olympic team because his all action style was better suited to the professional ranks. It was generally regarded that an Olympic Gold was crucial in establishing a superstar in American boxing (Ali, Sugar Ray Leonard, the later exploits of Oscar De La Hoya etc) but Tyson quickly became much more famous and marketable than Tyrell Biggs (the American boxer who had actually won heavyweight gold). In a sense Tyson bucked a trend. He turned professional with a first round knockout of Hector Mercedes at the Plaza Convention Center, Albany, New York, on the 6th of March 1985. “Iron” Mike is trained by Kevin Rooney, a former welterweight and another disciple of the House of Cus. Tyson was short for a heavyweight (about 5’10) but what he lacked in height he made up for in width. He radiated strength and power and had the most solid looking “shock absorber” neck (19 ½ inches) imaginable. One is reminded of AJ Leibling describing another short heavyweight – the great Rocky Marciano. “He has big calves, forearms, wrists, and a neck so thick that it minimizes the span of his shoulders. He is neither tall nor heavy for a heavyweight, but gives the impression of bigness when you are close to him.” With his all-action style, Tyson is compared to legendary heavyweight sluggers of yesteryear like Jack Dempsey and Joe Frazier. D’Amato does not work Tyson’s corner for poignant reasons. He doesn’t want Tyson to look over from the ring one day and see that he isn’t there anymore. The key to why the young Tyson is special? Speed. He had incredibly fast hands for a heavyweight and was devastating when he punched in rapid combinations. He was also hard to hit. Tyson had been taught the “peek-a-boo” high glove defence by his mentor Cus D’Amato and also used to move his head a lot more when he was younger and so rarely presented a stationary target. Jacobs and Cayton send tapes of his fights to news programmes and stills to newspapers and magazines. They market him brilliantly. Tyson looks invincible as a teenage boxing tearaway. His fights are over quickly in spectacular fashion and few boxers have had such presence in the ring. Tyson looks like some unstoppable primal force and is kept busy with a contant schedule of fights. Trent Singleton, Don Halpin, Ricardo Spain, John Alderson, Larry Sims, Lorenzo Canady, Michael Johnson, Donnie Long, Robert Colay and Sterling Benjamin all become 1985 knockout victims with only Sims and Halpin lasting beyond two rounds. “The body shot, it was like a sledgehammer!” marvels a bruised Benjamin after his encounter with Tyson. The competition is modest but Tyson is already landing on magazine covers before he’s even attained a world ranking or fought a fringe contender. In 1985 D’Amato dies and the single most important person in Tyson’s life becomes Jim Jacobs, who Tyson loves and trusts. Tyson is devastated by the death of D’Amato and a part of him dies too. He claims later that boxing was no fun anymore. He had no one to please or make proud of him. He felt alone. But Tyson is soon pressed back into service and rounds the year off with early kayo wins over Eddie Richardson, Conroy Nelson, Sammy Scaff and Mark Young. ABC pay $850,000 to put four of Tyson’s upcoming fights on Wide World of Sports. The bandwagon is starting to roll. 1986 would be a fateful year for Tyson and his level competition is stepped up as a title shot begins to become a distant thought for the first time. Dave Jaco is dispatched in the first and then a big white journeyman named Mike Jameson lasts into the fifth. Fringe contender Jesse Ferguson (who later upset the Olympian Ray Mercer) takes Tyson into the sixth round in a bruising encounter. It is the first experience many boxing writers have of “Tyson Mania” at first hand and they come away impressed by the raw power of the young prodigy. Jimmy Jacobs is not amused though when Tyson makes a comment about wanting to drive Ferguson’s “nose bone into his brain” to the press. It’s flippant (if somewhat dark) humour from Tyson but it doesn’t help to project the sort of image businessmen Jacobs and Cayton want their young charge to project. The street kid in Tyson is always lurking barely concealed. This inner turmoil is controllable for now but it sometimes makes for a heady cocktail (even in the early days) when sluiced with the fistic arrogance that D’Amato drilled into him and encouraged. After a blowout of Steve Zouski, Tyson’s first major test comes when he fights James “Quick” Tillis in May. Tillis was good enough to have fought Mike Weaver for the world title (or at least a version of it) in 1981 and was a stepping stone for many young prospects. He was crafty and durable and becomes the first person to extend Tyson the full ten rounds, ending his knockout streak. One can see here for the first time that it is possible to frustrate and negate Tyson’s blistering offensive and that – like all big punchers – Tyson was prone to frustration if his opponent was still there after a couple of rounds. A dubious knockdown for Tyson costs Tillis a draw on two cards. Tillis showed that Tyson was human, even one-dimensional sometimes if you were dogged and clever enough. Tyson’s next fight against Mitch “Blood” Green also lasts the full ten rounds and Tyson’s marketability takes a slight stumble as a consequence. Green is from Tyson’s backyard and an unstable character who used to be a street gang leader in his younger days. The pair will be forever entwined when they have a street brawl in Harlem in the early hours a few years later. The later encounter outside the ring joins the mounting evidence that Tyson is unravelling fast and not mentally equipped for fame. But back to 1986 and their legitimate fight in the ring at Madison Square Garden. Green is a huge heavyweight at 6’5 and uses an octopus like grip to hold and frustrate the shorter Tyson. Green is never in any danger of winning the fight but – like Tillis – he does present a blueprint of sorts for anyone looking to survive against the young dynamo. Eager to restore Tyson’s image as a destroyer after two points decisions, his handlers throw him a couple of journeymen in the form of Reggie Gross and William Hosea. Both are dispatched by Tyson in the first round and, in June, Lorenzo Boyd is stopped in the second. The following month Tyson is back in the ring for what appears on paper at least to be a sterner test but is actually a shrewd choice of opponent – Marvis Frazier. Frazier is the son of the great former heavyweight champion Joe Frazier and Joe was also his manager, trainer, and generally everything. Marvis was a decent heavyweight who was often in the top ten and capable of using his boxing skills (he was a world class amateur) to outbox bigger men but he was also small for a heavyweight and had none of his father’s power or strength. In 1983 Marvis was 10-0 with his best wins coming against the overweight James Broad and a faded Joe Bugner when he was thrown in against the formidable heavyweight champion Larry Holmes. Holmes stopped young Marvis in the first round, showing a palpable sense of distaste for his task. As Holmes batters the groggy Frazier on the ropes after the first knockdown one can clearly see Larry compassionately motioning for the referee to stop the fight. Although Marvis had since repaired his career to a modest degree with several wins and some decent scalps in James “Bonecrusher” Smith and Quick Tillis, Tyson’s management were certain that the younger Frazier lacked the physical strength or firepower to keep Tyson at bay. The press shared that analysis and criticised Joe for making the fight in the first place. In what was arguably the most ferocious and devastating performance of Tyson’s entire career, Marvis was stopped in 30 seconds of the first round, an uppercut leaving him helpless on the ropes where he slumped to the canvas. He never stood a chance of beating Tyson and Joe Frazier was lambasted for effectively sending his son out to be executed. Joe did not distinguish himself greatly after the fight. He said he smiled at the fate of Marvis because that’s how he liked to see a man go out – on his shield so to speak. Marvis barely threw a punch so it wasn’t exactly the most glorious defeat. Joe also got a lot of attention for his comments about Tyson after the fight and suggested that maybe he should be the one to test the young prospect! Tyson maintains his dignity when asked about the trash talk that Frazier Sr has thrown his way. “I’d be a fool to get into an argument with Joe Frazier,” says Tyson and leaves it at that. Tyson was quickly back in the ring against the huge Cuban heavyweight José Ribalta. Although Ribalta tended to lose his big fights he was a tough heavyweight capable of mixing in world class circles. He gave a spirited performance against Iron Mike and lasted into the tenth round before he was stopped. There would be one more fight for Tyson before his title shot. Alfonso Ratliff was the former WBC cruiserweight champion and a decent test on paper although he had lost to Pinklon Thomas and Tim Witherspoon in earlier forays into the heavyweight division. Ratliff tried to use his mobility to evade Tyson but was stopped in the second round, never recovering from the effects of a crunching left hand punch that deposited him on the seat of his trunks against the ropes. Tyson’s world title shot was arranged for November at the Hilton Hotel in Las Vegas. If he won he would be at 19 the youngest boxer to win a portion of the heavyweight championship. The opponent would be the Canadian based Jamaican WBC champion Trevor Berbick. Berbick had upset the highly touted Pinklon Thomas to win the title. Although Berbick had lost three times to Bernardo Mercado, S.T Gordon and Renaldo Snipes, he was good enough on his day to have outpointed hot prospect Greg Page and gone the distance with Larry Holmes. Berbick is a strong, roughhouse (if somewhat crude) heavyweight and expected by many to give Tyson a test. We can discount Berbick’s points win over Muhammad Ali in 1981. Those involved in making that fight should be forever ashamed. Berbick had Tyson’s old trainer Angelo Dundee working his corner and the camp exuded confidence in the preamble to hostilities. Dundee was born in Philadelphia in 1921 and wasn’t a boxer himself. He got into training fighters when his brother Chris became a big cheese on the Miami boxing scene through promoting. Dundee soon began to formulate his own theories about how to motivate and prepare his charges so that they were fully prepared for the ring. He worked with Carmen Basilio and the light-heavyweight Willie Pastrano before the young Cassius Clay entered his life. Dundee said that Ali had a gigantic ego and was difficult to train in a conventional sense. You couldn’t programme him to fight to a disciplined plan because he was so instinctive and prone to do what he felt like doing at any given moment. So Dundee had to use reverse psychology. Angelo would praise Ali after a session for doing a particular thing (that he wanted Ali to do more of) as if Ali had thought of this approach himself. ‘I added a few wrinkles,’ reflected Dundee. Dundee’s later curriculum vitae had seen him working with the great Sugar Ray Leonard. He knew he had his work cut out trying to come up with a strategy that would negate Tyson’s speed and power. While a number of boxers were intimidated by Tyson and seemed to have lost before the bell had even rung, Berbick was not phased by his task and even tried some kidology by insisting on wearing black trunks and boots into the ring. Tyson always wore black in tribute to old time fighters but it was the champion’s prerogative to choose colours so Tyson picked up a fine for his attire this night of nights. Tyson later revealed that he was suffering from gonorrhoea but had been too embarrassed to see a doctor when he fought Berbick. He also confessed that Muhammad Ali amusingly whispered “Get him for me” when introduced to him in the ring before the fight. Berbick was slain by the forces of his own bravado and Tyson’s blistering speed and ferocious power. He tried to maul, attack and hold his ground and paid the price. After a rocky first round, the West Indian was demolished in the second, the finishing touch coming from a delayed reaction to a clubbing inside punch from Tyson as they wrested close. The punch shattered Berbick’s sense of balance and took his legs away. It’s still an extraordinary sight to see Berbick fall no less than three times from one punch. The shellshocked Dundee was amazed by Tyson’s handspeed at close quarter. The teenager seemed to be the real deal. Now that Tyson had claimed part of the title it was time to go after the other champions in the HBO heavyweight unification round robin that was under way. Tyson’s toughest opponent was expected to be the savvy and teak tough WBA champion Tim Witherspoon. Many in boxing felt that if anyone could beat Tyson it would be Witherspoon although even “Terrible” Tim would start as a decided underdog given Tyson’s rampant trouncing of the usually sturdy Berbick. But late in 1986 Witherspoon suffered a shocking loss when he was stopped in the first round by late substitute James “Bonecrusher” Smith – despite the fact that he had outpointed Smith in an earlier clash. Witherspoon seemed completely out of love with boxing in the fight, offering little resistance as Smith clubbed him with powerful right hands. Tim was embroiled in a growing dispute with promoter Don King and felt he was not getting the rewards his efforts had deserved. When Witherspoon defended his heavyweight title against Frank Bruno in London in 1986 both men were contracted to receive around a million pounds. Witherspoon’s share of his one million pound purse, after King had deducted his fee and training expenses, was a paltry $90,000. Bruno ended up with several times more than Witherspoon despite being the challenger. Witherspoon’s passive surrender had revitalised Smith’s up and down career and he was now confirmed as Tyson’s next opponent with the WBC and WBA titles on the line. After losing his first professional fight to James Broad, Smith had gone on an unbeaten streak which ended when he lost in the twelth round of a world title challenge to Larry Holmes. Smith could be frustratingly inconsistent despite his 6’4 frame and punching power. He knocked out British prospect Frank Bruno in the tenth round and former champion Mike Weaver in the first but dropped a decision to the light hitting Marvis Frazier and was handily outpointed by the talented Tony Tubbs. The consensus was that his fight with Tyson would be short but explosive. Whoever got their bombs in first would win. That common prediction proved to be completely wide of the mark. In the space of twelve tedious rounds, Smith went from Bonecrusher to “Bonehugger” as he wrapped the shorter Tyson in frequent embraces and held incessantly. Smith simply went into survival mode, content to last the distance losing every round rather than try and win the fight. It was a frustrating night for Tyson and television audiences as the expected fireworks failed to appear – save perhaps for a moment in the last round when a right hand by Smith seemed to jolt Tyson for a moment. It was too little too late with Smith losing by scores of 106-120, 107-119, and 107-119 on the judges’ cards. Jimmy Jacobs took his own revenge on the lacklustre nature of the fight by banning Smith from appearing on Tyson undercards in the future. Although Tyson is now one of the most lucrative and talked about athletes in the world, 1987 seems to be the year when his personal life begins to fray and threaten his long term boxing success. There is an assault and battery charge and the first rumblings of discontent with his trainer Kevin Rooney. He’s champ and incredibly wealthy but, somewhat lonely, is seeking the perfect wife. Tyson’s ultimate quest was to meet Cosby Show star Lisa Bonet. The enigmatic Bonet is apparently not interested but Tyson does manage to arrange a date with Head Of the Class star Robin Givens. Tyson was surprised when Givens arrived with her mother and publicists in tow. Alarm bells should have been ringing but the pair are soon married. Tyson is back in the ring in May to fight former champ Pinklon Thomas. Thomas has a great jab and Angelo Dundee in his corner but Dundee goes 0-2 against Iron Mike when Thomas is stopped in the sixth by a blizzard of punches that could have felled a ten storey building. After a shaky first round Thomas had been doing fairly well negating Tyson’s offensive thunder but once he got caught the end was inevitable. The HBO tournament to unify the heavyweight championship had suffered a fork in the world when Michael Spinks was stripped of his IBF title for refusing to fight the number one contender Tony Tucker. Spinks, a distinguished former light-heavyweight champion, had made history when he outpointed Larry Holmes for the heavyweight title in 1985. Spinks repeated the feat by outscoring Holmes in the rematch in 1986. He was the linear champion (or “People’s Champion” as his team preferred to say) but Spinks and his close friend and promoter Butch Lewis did not want television dictating who they should fight next. The wins over Holmes were controversial, the rematch in particular with many observers feeling that Holmes had done enough to win but got a raw deal from the judges. Holmes, to put it bluntly, was never one of the most liked heavyweight champions. His reputation sunk to a low in 1985 when, after building a perfect 48-0 record and on the cusp of drawing level with Rocky Marciano’s famous 49-0 mark, he lost that close decision to underdog Spinks and in a bitter post-fight press conference made an infamous and ill-judged comment about Marciano being unable to carry his jockstrap. Spinks and Lewis knew that for Michael, a blown up light-heavyweight now over thirty and with dodgy knees, it was now a question of getting the maximum amount of money for the least amount of risk in the time he had left. The thoughtful and reclusive Spinks was not someone who was going to end up like his brother Leon. He would happily retire and walk away when the time came. Spinks and Lewis turned their attention to a rusty but valuable antique by the name of Gerry Cooney. Cooney, a 6’6 tall white heavyweight from Huntington, New York, was once projected by his managers Mike Jones and Dennis Rappaport to become the world’s first billion dollar athlete. A real life Rocky. The handsome and genial Cooney was boxing’s poster boy in the early eighties and raced to a superfight with Larry Holmes in 1982. The fight turns out to be man against boy though as Holmes navigates Cooney’s thunderous left-hooks to the body and stops the brave but exhausted challenger in the thirteenth round. Whereupon Cooney went into hibernation, fighting just five rounds in the next four years against the unthreatening trio of Phillip Brown, George Chaplin and Eddie Gregg. Carefully matched and frequently inactive, Cooney made millions of dollars from boxing because of his skin pigmentation. The fight between Spinks and Cooney was set for June 1987 in Atlantic City. Despite his inactivity, Cooney was the slight favourite with oddsmakers because of his sheer size and vivid memories of that devastating left-hook. Surely he would be able to blast out a little fellow like Spinks once he had him trapped? But when the fight started Cooney fought like a man who had been embalmed. He was frozen and mechanical and seemed unable to pull the trigger on the left-hook the way he used to in the past. Spinks had a look-see for a few rounds and then, realising that the lumbering giant in front of him was no threat at all, began to flash a powerful jab and tee-off on the big New Yorker. Cooney, like many big punchers, often looked bewildered and confused when someone actually had the temerity to start hitting him back and displayed a hopeless lack of defence as he was stopped in the fifth round, hitting the deck twice. It was mission accomplished for Butch Lewis and Spinks. Whatever his merits as a fighter by 1987, Cooney was a big name and now Spinks even had folks wondering if he might be the person who would hand Tyson his first defeat. Conventional wisdom was that Lewis and Spinks were terrified of Tyson. Now it was just possible that Jacobs and Cayton might be having second thoughts. The logic went something like this: if Quick Tillis can give Tyson fits then what about an even more intelligent and cunning pugilist like Michael Spinks – one of the greatest light-heavyweight champions of all time? It was conjecture but having navigated Cooney’s bombs and thrown a few of his own, Spinks had given everyone something to think about. The IBF belt that Spinks vacated was picked up by Tony Tucker when he stopped James “Buster” Douglas in the tenth round. It was a fight that neither man seemed especially desperate to win but Tucker had come from behind to batter the talented but sometimes unmotivated Buster. Tucker was given no chance at all against Tyson despite his physical gifts. He was a huge heavyweight with good speed and mobility but his level of competition was modest and Tucker could hardly fail to be distracted by a ludicrously complicated promotional and managerial arrangement that saw countless figures in the world of boxing claiming a piece of him. Tucker would later claim that he lost interest in the Tyson fight during training because he knew he would more than likely walk away with little of his pay packet. The fight – the claims of Michael Spinks notwithstanding – would unify the alphabet belts and create a unified heavyweight champion. Tucker, in red trunks, gave a better than expected account of himself at the Hilton Hotel, taking Tyson’s best punches and even temporarily lifting Iron Mike off his feet with an uppercut in the last round. Tyson won handily on the scorecards but it was another reminder that he could have frustrating nights if his his opponent was durable and knew how to tie him up. Tyson’s last engagement of 1987 was a bout with 1984 Olympic super heavyweight champion Tyrell Biggs. When the pair were amateurs it was speculated that Biggs and Tyson could be the Ali and Frazier of the eighties and nineties and forge a classic rivalry. While Tyson had been sensational as a pro and looked like an all time great in the making the same could not be said of Tyrell. Biggs had squandered his natural talent with drug problems and his professional career was unimpressive so far. Briggs had appeared on the brink of defeat against the faded David Bey before rallying to a sixth round stoppage and some wondered if throwing him in against Tyson after only fifteen fights was his management cashing in the payday while they still could. There was said to be bad blood between the pair but although Biggs later denied this it was the case it was clear that Tyson didn’t like him much and seem to harbour some sort of residual grudge from the amateur years. Tyson was given a few months off and then began 1988 with a fight against the great former champion Larry Holmes in Atlantic City. Holmes was 38 now and had been out of the ring for a couple of years. The thought of him taking on a devastating young slugger like Tyson made people think of Rocky Marciano having to batter a shot Joe Louis into submission. Born in Cuthbert, Georgia, into poverty, Holmes didn’t learn to read until he was an adult, drifting into small time criminal activities but eventually earning a living through boxing, chiefly as a sparring partner – most famously for Joe Frazier and Muhammad Ali in the early seventies. Frazier hurt Holmes in places he didn’t even know he had places in sparring sessions but it was as a sparring partner for Ali at Ali’s legendary Deer Lake training camp where Holmes made his name. The young Holmes often held his own with Ali as Ali would never fight flat out in sparring sessions but rather use them to hone a particular strategy he was working on. In 1980 Holmes and Ali would meet for real in the ring but Holmes was 28 and in his prime while Ali was nearly 40, hadn’t fought for two years and had absolutely nothing left. Holmes was honest about his deep reluctance and sadness at having to batter his idol and mentor. Holmes won the WBC heavyweight championship on June 9, 1978, with a 15-round decision over Ken Norton in Las Vegas and defended it an amazing 15 times before a big fall-out with Don King – who exerted considerable influence on the WBC through his close relationship with its Mexican president Jose Suliaman. So Holmes adopted the (then) lightly regarded IBF belt and continued to defend as the linear champion until the Spinks upsets – though of course not against Don King fighters. Holmes had made comments about fighting Tyson for a few years before their fight, declaring that he wasn’t much impressed by the young champion. Was he merely angling for a payday or did he really think he had a chance? Tyson was respectful of Holmes and said that D’Amato had always taught him to be wary of great former champions because even in their twilight they were capable of one last hurrah. The night of the fight Holmes looked strangely skittish and apprehensive as he limited himself to stretching out a long left paw, trying to keep Tyson at arm’s length and tie up the shorter man. It worked to a degree but Holmes barely resembled the man who had once dominated the division. He appeared heavy around the midsection and his once potent left-jab was a shadow of its former self. In the fourth Holmes got up on his toes and started flicking jabs as the crowd began to chant his name. A patient Tyson waited for an opening and then nailed Holmes with a crunching right-hand that dumped Larry on the canvas with an audible thud. Holmes was known for his amazing recuperative powers and somehow beat the count but he wasn’t going to last much longer. The former champ tried to wind up an uppercut but got his arm caught in the rope. Tyson knocked him cold with a devastating volley and the fight was over. Holmes later said he was there for the payday and never had enough time to train. “As I neared the ring,” said Holmes. “I had this weird thought: Why not be the first fighter to refuse to go into the ring? All those people watching on HBO, I’ll amaze them all.” Every boxer seems to have an excuse after a loss but we can maybe cut Larry some slack this time. Holmes returned to boxing again in the 1990s in his forties and upset hot prospect Ray Mercer and extended Evander Holyfield the full twelve rounds in a 1992 heavyweight title fight. The Holmes who beat Mercer was unquestionably in much better condition than the one whacked out by Tyson. With Holmes out of the way thoughts turned to Michael Spinks again. It was the fight that boxing wanted and the obvious Superfight for 1988. The intransigence of Butch Lewis demanding $15 million for Spinks was cited as the major obstacle although Tyson’s management had hardly been easy to deal with themselves. In the end third parties were able to (metaphorically) knock some heads together, or put people in a room at least, and Lewis finally signed an agreement for the bout to go ahead in June. Tyson would get $20 million and Spinks $13.5 million. All Tyson had to do first was beat Tony “TNT” Tubbs. The modern heavyweight championship – at least up until the days of Mike Tyson – had always been dominated by American boxers and so for obvious reasons of commerce and convenience championship bouts usually took place in the United States. Jacobs and Cayton liked the idea of Tyson rekindling the days of Muhammad Ali and undertaking a world tour of sorts. Ali would hit the road and defend his title in far flung places, from Africa to the Far East to Europe. It made sense for Tyson to resurrect this tradition because he was hugely famous and people around the world were eager to see him in the flesh. Tyson’s proposed schedule was supposed to see him fight Frank Bruno in London, Francesco Damiani in Rome, and perhaps even Adilson Rodrigues in Rio but none of these foreign adventures occurred in the end. One trip Tyson did undertake though was to Japan in March to defend his belts against Tubbs in Tokyo. Tubbs was symbolic of the overweight underachiever era of eighties heavyweights that included the likes of Greg Page and Tim Witherspoon. All were very talented but seemed to spend more time at the breakfast table than the gym. Tubbs was chosen by the Japanese promoters because his sheer girth and deft boxing skills were at least expected to vex Tyson for several rounds and give them value for money. That assumption proved to be completely wrong. Like Tyrell Biggs, Tubbs used his reach advantage and speed (Tubbs had fast hands for such a big man) to outbox Tyson in the opening stanza although the round was shared on the judges’ scorecards. Tubbs boxed well in the second too, again troubling Tyson with his speed. But Tyson was as implacable as ever, biding his time while he waited for a chance to unload his heavy artillery. Tubbs’ willingness to fight in close was his undoing. As the round neared its end Tyson landed a body-head right-hand combination and a woozy Tubbs was finished with a left-hook. The punch was so horrific that Tubbs’ trainer immediately entered the ring to signify that he wouldn’t let his stricken charge take any more punishment. When Tyson returned from Japan he was shocked to learn that his manager and friend Jim Jacobs had died. He’d been suffering from leukaemia for nine years but it had been kept secret from Tyson. The s*** really hits the fan when Tyson finds out Jacobs’ share of him now goes to his widow. Fate leaves Bill Cayton the only man alive out of the trio that created and established Tyson. But Cayton, a cold fish according to the boxer, wasn’t nearly as close to Tyson as Jacobs and D’Amato. At Jacobs’ funeral, Don King arrives like a vulture and gives Tyson a limo ride. He knows that control of Tyson is essential to anyone looking to control heavyweight boxing. Cayton, an astute businessman who has made some incredible deals for Tyson, is targeted by King and Robin Givens and her mother are soon chess pieces in King’s game. He tells them Cayton is ripping Tyson off. Cayton learns that Tyson has given Givens and her mother power of attorney to sign his cheques and financial documents. The millions of dollars that Tyson made suddenly look like easy pickings. The fight with Spinks took place in June at the Convention Hall, Atlantic City. It was the richest fight in history and both the live gate and television audiences around the world anticipated a classic encounter between two unbeaten champions (although Spinks had been stripped of his alphabet belt he was, lest we forget, the linear champion). Tyson was a heavy betting favourite but there were plenty of experts and pundits making the case for Spinks. At the very least maybe he would play Billy Conn to Tyson’s Joe Louis. In the dressing rooms before the fight, Butch Lewis, clad in a white tuxedo with no shirt, made what was obviously a big error when in his capacity as an observer he objected to a bump in Tyson’s wrapping and caused a delay by insisting it be rewrapped. In the end it was Spinks’ venerable trainer Eddie Futch who ended the nonsense by declaring he could see nothing wrong with the wrapping. Tyson was furious and paced around the room becoming more infuriated by the second. He told his trainer Kevin Rooney that Spinks was going to pay. Michael Spinks did not exude confidence as he made the long walk to the ring in a white robe. He seemed to be talking but he looked distracted and unsure of himself. Tyson was Tyson. He looked all business and deadly serious. While Spinks looked dry and slightly paunchy at a career high 212, Tyson dripped with sweat and looked like a tank in human form. Spinks stared down when the boxers came together for their instructions, like a man heading for the firing squad. At the bell Spinks seemed to forget everything he’d ever learnt about boxing (which, needless to say, was a considerable amount). It was no secret that he was a notoriously slow starter while Tyson’s record was awash with early knockouts. Spinks needed to fight the first round as if it was the fifth. He had to minimise contact and establish a jab. Was it fear that made him forget everything? Spinks lumbered towards Tyson in clumsy fashion, initiating clinches (the last thing Futch wanted him to do because that would be a test of strength with only one winner) and throwing a few weak telegraphed right-hands that looked desperate. Tyson manoeuvred him towards the ropes and landed a right to the body which made Spinks take a knee to regroup. It was the first time Spinks had been down as a professional boxer. When the action resumed Tyson knocked Spinks unconscious with a right-uppercut and with only ninety seconds of the first round gone the contest was over. The Superfight had been the Superslaughter. Tyson now appears to be unstoppable with the world at his feet but chaos is about to envelop the increasingly troubled young boxer. He rails at the press after the Spinks fight and threatens to retire. 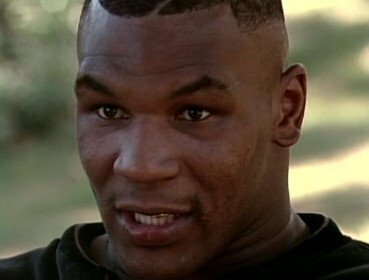 Tyson was supposed to fight Frank Bruno next in London but the fight is endlessly rescheduled as Iron Mike is in no condition to think about boxing. He will not fight again in 1988. Tyson sues Bill Cayton to try and break free from his managerial contract. Cayton eventually agrees to cut his one-third share of Tyson’s earnings to 20% but the fighter has slipped from his grasp and the estrangement will not be repaired. By now, Tyson’s wife Robin Givens has gone public with allegations of him beating her and, in August, Tyson breaks a bone in his hand after an infamous 4am altercation with former opponent Mitch Green in Harlem – further pushing back any proposed fight with Bruno. Tyson crashes his BMW into a tree and reports swirl that it was a suicide attempt. Then there is the extraordinary sight of Givens humiliating Tyson in an interview with Barbara Walters on ABC as Tyson sits mute by her side. Tyson later says Givens and her scheming mother wanted to provoke a reaction from him on air. Givens files for divorce in October and that same month Tyson signs an agreement with Don King. “The leeches are out now,” says Tyson’s trainer Kevin Rooney. He’s soon fired for his troubles. “Don King is a hip exploiter, an intelligent flesh peddler,” wrote Jack Newfield. “He knows which fighters to steal, how to exploit anyone’s vice, vanity or insecurity and make a profit for himself.” The young Don King was a a petty criminal involved in gambling and a ‘numbers racket’ in his home city of Cleveland. He once shot and killed a man but got off on a case of self defence and justifiable homicide. He wasn’t so fortunate when he kicked to death a gambler who owed him $600. He got four years in prison for manslaughter. In 1971 King listened to the first Ali v Frazier fight in his jail cell on a radio. Four years later he was personally promoting the third Ali v Frazier in Manila. In this case truth is stranger than fiction. King got into boxing by accident really. When he was released from jail he asked Muhammad’s Ali’s people if Ali would box an exhibition in Cleveland to raise money for the local hospital. Ali, generous soul that he is, agreed to support the charity event and went to Cleveland for the exhibition. King raised $86,000 from the event but Cleveland Hospital only got $5000 of it. That was the way King operated right from the start and the exhibition opened his eyes to the possibilities of boxing for a sharp man like him. There was a fortune waiting to be made in this shadowy business. He knew he was smarter than the people who controlled boxing and a great salesman. Don King is encapsulated by a moment at the end of a contest between King’s fighter Michael Dokes and a South African named Gerrie Coetzee in 1984. Dokes was counted out on the canvas late in the bout and lost his WBA heavyweight title. His abiding memory of the fight is lying groggily on the canvas trying to regain his senses and seeing his promoter and ‘friend’ Don King step over him to go and congratulate Coetzee. This was of course the secret of King’s success. He did his utmost to leave with the winner. King is known in boxing as ‘Teflon Don’ for good reason. He’s cheated boxers out of millions, been investigated numerous times for tax evasion and insurance fraud, and used his influence with boxing organisations to rig ratings and get his boxers title fights. Nothing has ever quite stuck on his slippery customer though. A lawyer who cross-examined King in court during one of his many tax evasion cases said King was the most intelligent and tricky person he had ever questioned. King read voraciously in prison and emerged with that booming windy loquacious Shakespeare quoting manner that so charmed journalists and boxers who didn’t know any better. Ali was King’s passport to fame but he had no compunction about sending him out to get battered by Larry Holmes in a dreadful mismatch at the end of his career and ripped Ali out of millions over his purse for that bout. King started promoting in Ohio on a small scale but he was incredibly ambitious and a twisted genius who could sell ice to Eskimos. One other despicable thing about King is the way he’s played the race card in his career. He would always take advantage if he was after a black boxer with white managers, making sly accusations of racism and slavery. More than one person has quipped that the only colour King really cares about is green. Tyson ended 1988 by being sued by a woman claiming he’d grabbed her behind in a nightclub. The fight with Frank Bruno had been called off several times but was now switched to the United States and arranged for Las Vegas in February. Bruno probably didn’t deserve the fight but he was marketable because he was British and had a big following in his home country. Bruno was a magnificently sculpted heavyweight and a big puncher but he was thought to have a stamina problem and had never seemed to learn how to hold when hurt. Although he was often dubbed “weak chinned” by American pundits it was the stamina and lack of savvy that seemed destined to stop Bruno from ever becoming a world champion. In his two defeats he had been boxing well against Bonecrusher Smith and Tim Witherspoon respectively until the end. He was well ahead of Smith on points when he was caught and just seemed to freeze as punches rained down in the last round. Against Witherspoon in a 1986 title challenge, Bruno appeared to run out of gas in the eleventh round of what had been a relatively even fight for the most part. Bruno had been inactive for over a year to preserve his Tyson payday but it hardly seemed to matter as no one have him a chance anyway. His last contest was an eighth round stoppage of a comebacking Joe Bugner in London at the end of 1987. It was a huge domestic fight in Britain because Bugner had irritated British fans by decamping to Australia and rebranding himself “Aussie Joe”. Bugner was about as Australian as Mike Tyson but the Aussies were happy to take any boxers they could get. In truth, Bugner had always been the man in the black hat in British boxing ever since he won a highly controversial decision over the beloved Henry Cooper for the domestic title in the early seventies. Bruno was the most popular British boxer since Cooper and his battering of the faded Bugner only increased his popularity. It was hard to see though how the upright, mechanical Bruno could hope to last long against prime time Tyson. Tyson entered the ring to fight Bruno on the 25th of February 1989, less than a fortnight after his divorce from Robin Givens. No sooner had the fight begun when Bruno took a knee after Tyson quickly rushed him with a volley of punches, staggered him inside, and then sort of cuffed him down with a right that seemed to graze the top of Bruno’s head. It looked as if a repeat of his wipeout of Spinks was on the cards. Maybe he should fight Godzilla next so television could get a few adverts in. So the executives probably mused at the time. But Bruno, in a brave if ultimately futile stand, started to fight back when he got up. He held Tyson with his long arms and clubbed him around the back of the head. He had a point deducted for holding but it proved if nothing else that the big Londoner would not be intimidated and had been taught how to grapple in the gym. Before the first round was over, Tyson moved in close and was caught by right-hook and then a short left-hook. His legs did a funny dance for a second and he appeared to be wobbled but Bruno couldn’t land any follow up punches and the chance of a monumental upset faded. Tyson gradually took control of the fight thereafter, his handspeed too much for the challenger. Bruno was stopped in the fifth as Tyson punished him against the ropes with a vicious assault. It had been a somewhat shambling performance by Tyson and with his personal life in meltdown one could hardly blame him for being distracted. There was more trouble for Tyson in the spring when he was accused of hitting a parking attendant outside a nightclub in Los Angeles. The carefully protected image that Jim Jacobs had once tried to engineer was blown to the winds by now. Tyson’s once busy fighting schedule was becoming more and more sporadic. He fought once more in 1989 when he took on Carl “The Truth” Williams. Williams was a tall, talented heavyweight with a superb jab. He took Larry Holmes to a disputed points decision in a 1985 title fight but then seemed to be eliminated from the heavyweight sweepstakes when the veteran Mike Weaver stopped him in the second. But in 1987 Williams got right back into contention when he upset the streaking powerpuncher Bert Cooper with a stoppage after eight rounds. Cooper was from the Frazier stable and so carried the sobriquet “Smokin'”. A short, compact puncher like Tyson, Cooper was hot stuff for a while and after he demolished the Canadian hope Willie de Wit thoughts had turned to a Cooper v Tyson fight. Williams boxed superbly and took Cooper’s place in the Tyson lottery, exposing Bert’s limitations against big heavyweights. If Williams – with his height and great jab – could defuse an explosive slugger like Cooper than perhaps he might be in with a chance of doing the same to Tyson? The most salient objection to this line of speculation was that Williams was not known for his sturdy chin. And Mike Tyson was not Bert Cooper. Tyson seemed better able to put external distractions to one side against Williams than he had done against Bruno in January. A perfect left-hook collapsed the huge challenger early on and although he rose to his feet and told the referee he was ok the contest was terminated at 1:33 of the first round. Williams and his corner protested vehemently at the stoppage but it was hard to see the point of him carrying on. Tyson would have nailed him again sooner or later.